The stamps you sent were issued in 1922 by the Ministry of the Interior of the Khorezm National Republic. The stamps were issued in two variants, 5000 rubles for regular correspondence and 10000 rubles for the recommended. 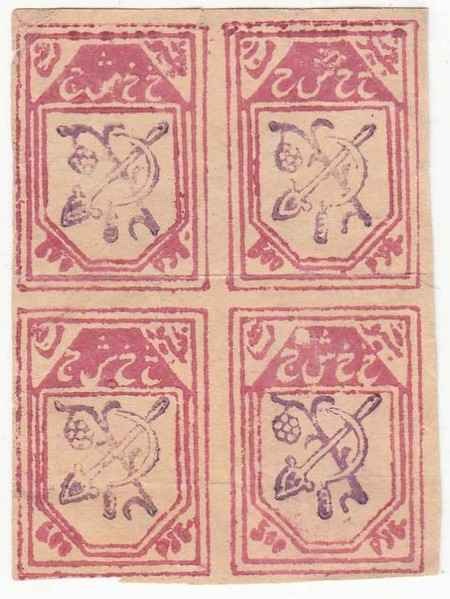 The stamps were intended for postal use within the Republic of Khiva. Foreign correspondence was franked with existing RSFSR stamps. According to unverified reports, these stamps were made lithographically in a local printer. Labels with the 10000 rubles were not retained. I cannot tell you more about your question because there are almost no witnesses here. If you need anything on this matter, let me know and I will take steps to get the information you are interested in. Head of the Lavrov Regional Union. 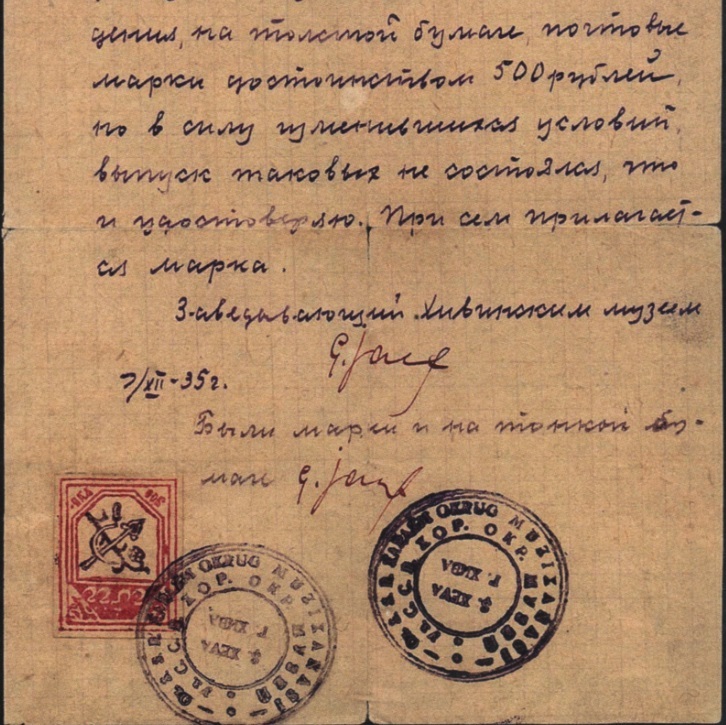 After inquiries from the Leiningrad philatelists, it became clear that no stamps of the Khorezm Republic were known. They are not mentioned in the SFA catalog, so I do not think it would be interesting to familiarize the reader of the Soviet collector with these stamps. The reproduction of their block of nine is enclosed. At the same time, the federal museum sent a request to the Khiva Postal and Telegraph Institutions to provide a number of additional information on Khorezm stamps. Once the answer is received, it will also be sent to the Soviet Collector magazine, of course, if, reliable material is sent. 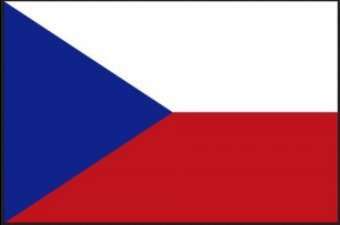 On the above-mentioned Slovak web site, a brief description of the stamp has already been published. On the Russian pages I found a more detailed one (for the 500r stamp) and I publish it here: In the upper-right corner there is the inscription „besh yuz“ = 500. In the upper-left corner there is „manat“ – currency shortcut. Between them there are 4 letters KH KH SH ZH = it is the abbreviation of the name Khorazm khalk shoralar zhumhuriya (Khorezm National Soviet Republic). 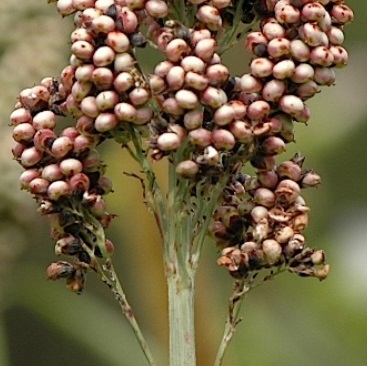 At the center of the stamp there is a national emblem characterizing the peasant work: sickle, shovel and twig sorghum (cereal). At the bottom, on the left there is the nominal value and the ruble on the right. Commment: I was surprised by the abbreviation KH KH SH ZH. For the writing of the language, up to 1927, the Arabic script was written from right to left. Therefore, there are two same symbols characterizing KH on the right. These are characters خ . Therefore, the correct orientation of the Khorezm stamps is the one in which the RUB. 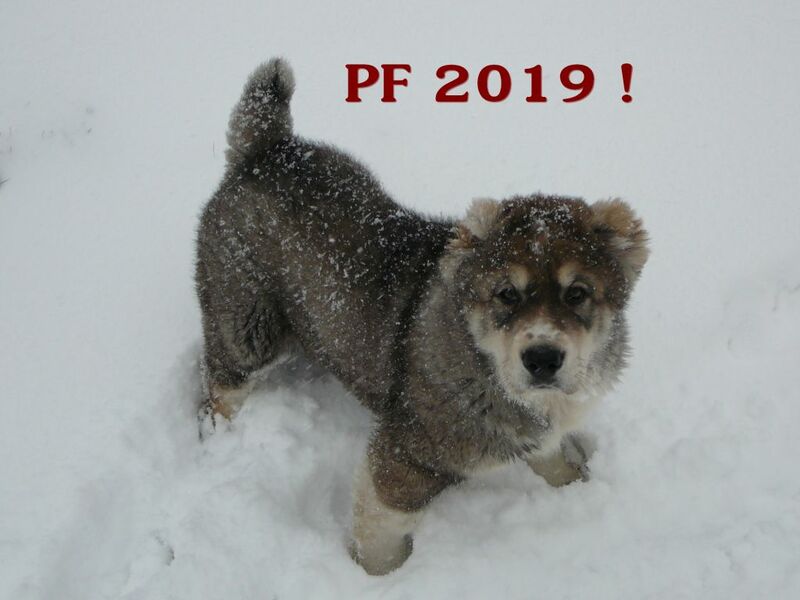 (in Cyrillic РУБ.) text is in the bottom right. Occasionally, we encounter a wrongly rotated stamp. 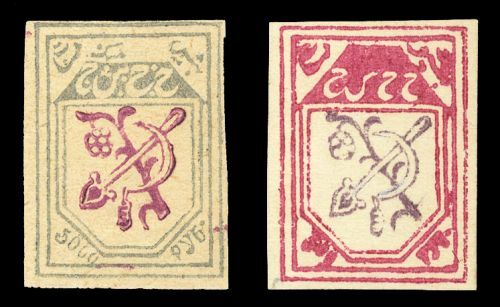 As a plant in the middle of the Khorezm stamp, a cotton twig is usually mentioned (even in catalogs). I do not know why the new state emblem of 1921 transferred to the mark should have the cotton instead of sorghum? 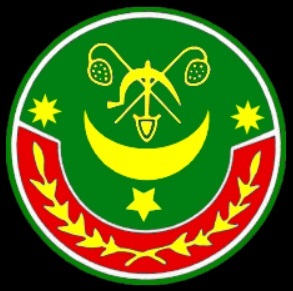 More about the Khorezm State Emblem can be found at this address. Information on when the cotton became more cultivated, whether it was after collectivization, I did not find out. Does anybody know? We cannot ask the creator of the stamp, but I prefer the same symbol as in the state emblem. The third of today’s curiosities was inspired by the Lyapin catalog release. The 500r stamp recognizes three colors in the middle of the stamp (gray, crimson and purple) and three paper variants: 1 = plain paper, 1A = thin white paper, 1B = thin white paper with vertical grooving. 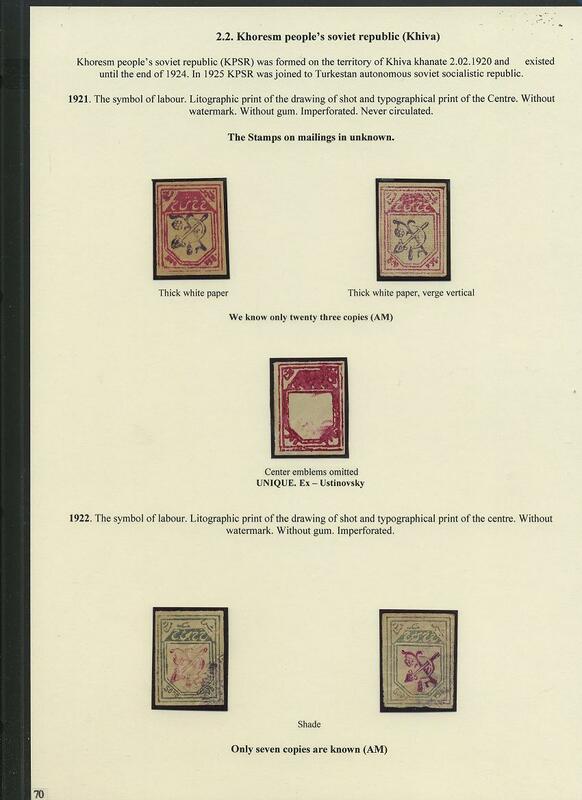 It also provides information that thin paper variants 1A and 1B are probably reprints. Comment: This is a very interesting statement, so far I have not heard about reprints from Khorezm. I will try a small speculative deduction: If it really was, like this, I would begin to be suspicious of the following detail, which attracted me to the confirmation given for the Khorezm stamp in Stamp Atlas of Asia (2nd Edition) from Jiří Marek. 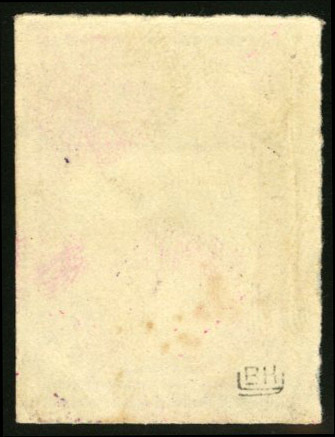 At the end of this confirmation below the date and signature, there is a later added sentence written by another ink that the stamps were also printed on thin paper. 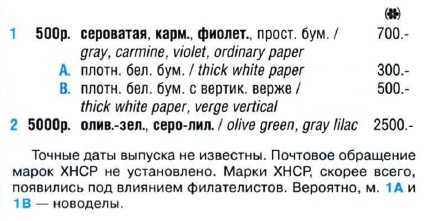 Originally, only thick paper is listed in this confirmation. The sentence is not written over the entire width of the line because there was a stamp already affixed there. The second signature is conducted in such a way that it does not interfere with the stamp on the right that has already been there before. I dare say that both stamps have the same rotating angle (almost „upside down“) and after being soaked in the stamping color, it was first stamped on the right and then with less color on the left. 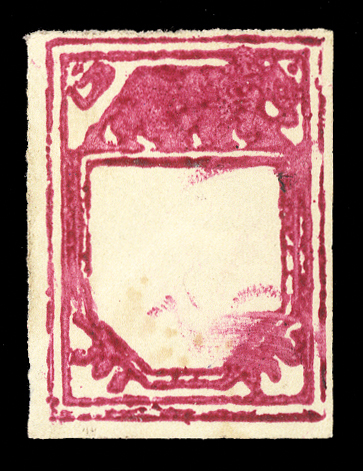 The Bokhara stamp for confirmation is stuck (and upside down) so the thickness and possible paper composition can be found worse traceable. Why would they still print the stamps (on thin paper) that were not put into circulation? Why and for whom was it so important that the sentence was added to the confirmation? Was it beacuse of philatelic business ? Who knows ? This latest curiosity appeared in 2016 at the Cherrystone auction. Besides very interesting specimens from Bokhara (see my article), there was also a stamp of Khorezm without a central part. I have not seen such a thing before, do you? Despite the fact that it was not very trustworthy for me, the unknown buyer did not hesitate to win this anomaly for $ 2400, without buyer’s premium. Added on 27.10.2017: After a year and a half after publishing this post I managed to add new information. The original owner of this stamp was the Russian collector Vadim Nikolajevich Ustinovsky, an expert on postage stamps of the Civil War 1918-24. 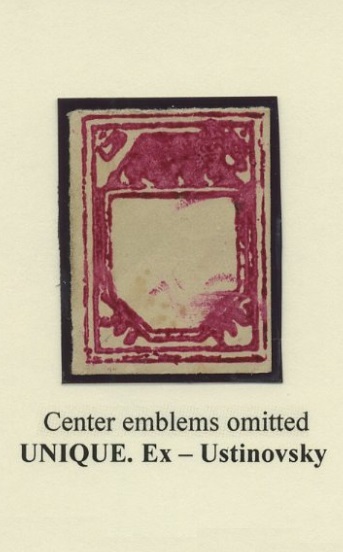 We can therefore guarantee that this stamp has been properly examined. At the Cherrystone 2016 auction, the new owner became the well-known Moscow philatelist Aleksandr Mramornov. He installed it in his large exhibit Civil War – on the Khorezm page. Added on 4.8.2016: I am delighted because this article was published in philatelic journal MERKUR REVUE 3/2016 ! Many thanks for editing to Kateřina Szostoková !